According to the Delaware Valley Regional Planning Commission (DVRPC), by 2020 the population for Chester County is projected to reach 543,702, an increase of 9.0%. The adopted DVRPC forecasts serve as the official adopted forecasts for Chester County government. 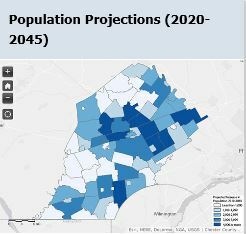 Using a somewhat different methodology, the Pennsylvania State Data Center (PASDC) has projected that Chester County will have a population of 533,835 (a 6.5% increase) by 2020. Furthermore, PASCD projects that Chester County will be one of six counties in the state projected to experience over a 20% population increase by 2040. Population projections are used for many planning and public service programs to guide decisions and allocate resources. The larger story provides additional information on how the projections are prepared and how the numbers equate to local municipalities that use the projections as part of their own planning programs.